The exhibition Wonder Why: Observe, Imagine, Create is a collection of core science interactives that explore the scientific process at a level accessible to all audiences. 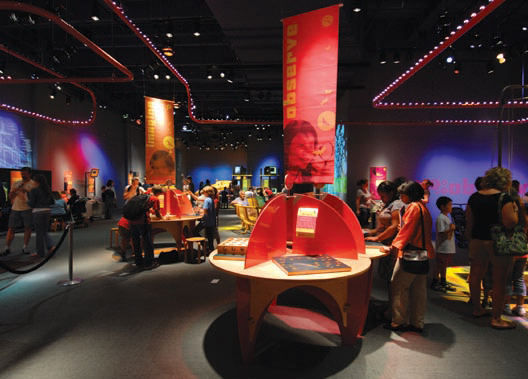 The challenge of this exhibition was taking some twenty existing interactive exhibits that had been housed in and branded to numerous exhibitions, and refurbishing and reconfiguring them to create a cohesive whole under new interpretation, all with a total budget of $50,000. The graphics in Wonder Why are successful in achieving their content goals with a minimum of text on each panel, making them very accessible to a younger audience. Brightly colored puzzle tables paired with hanging banners became focal points in the gallery, serving as a visual reinforcement for the three content zones of the exhibition. Creative lighting adds a sense of whimsy and wonder to the gallery, tracing exhibit structures and projecting onto gallery walls. A testament to the success of the gallery's simplicity, Wonder Why has become one of the museum's most popular galleries for families and young children. Bright colors and creative lighting bring the gallery to life.